The new series of very limited Escape will be available on the Sandero Stepway the end of 2019, with only 400 copies. After a vote of the public during the World of the Car, Dacia announced what the limited edition has had its favours, and will be produced in small series the end of 2019. This will be the Sandero Stepway Escape ! Dacia is one of the few brands that allows the public to have a role in the creation of some special series. The brand of Romanian had already tried the experiment with the special series Navy in 2017, and has renewed this year. 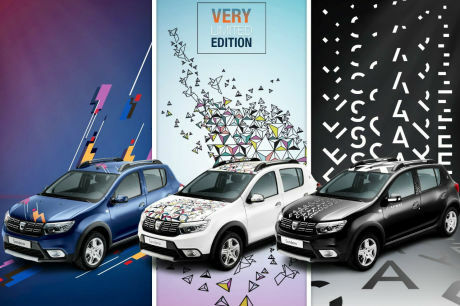 After a contest set up in the month of July, which allowed users to propose their own design for a limited series, Dacia has requested the public of the World of Paris to vote between three designs selected. Between the Blue Night, Evolution, and Escape, this is the series Escape, which has been chosen by the public. Today, the brand announces to us that it is the design Escape, directed by Flora Jammes, who has finally been chosen and that will give personality to the new very limited series of the Sandero Stepway, marketed by the end of the year 2019. The young designer is the co-creator of a group named Autumn Studio. While 100,000 people have participated in the voting, the design of Flora Jammes was chosen with 38 000 votes, elbow-to-elbow with those of the other two finalists Aurélie Abric and Stone Former. Dacia welcomes the massive participation of the public in the operation, ” an event praised by the community, still very active, which voted overwhelmingly in line to elect its favorite design “, as expressed by Sandrine Paralieu, brand Manager.